During the late 19th and early 20th centuries, the area south of Pack Square was the center of the black business district, complete with doctors, lawyers, restaurants, a drug store, boarding house, library and the Young Men's Institute. Brick buildings had replaced frame ones around the turn of the century, and 42-44 South Market Street is the earliest brick building (built in 1891) in the Downtown Area Historic District. At first glance the circular limestone panel in the stepped parapet indicates that the building was built in 1926. In actuality, the front fa�ade is a 1926 alteration to a much older building constructed for A. M. Gilmer Carriage Works in 1891. Housing many different uses over the years, the building was home to one of the community's most important institutions, the African American Masonic Temple. The third floor retains the auditorium and raised platforms used in ceremonies from 1912 to 1951. In 1775 15 African American men of Boston, Massachusetts, organized the "Africa Lodge," the first African American Masonic Lodge in the Nation. By the turn of the 20th century, North America had a membership of 39,253 black masons, including the members of Asheville Lodge, #367. Today, the building continues to serve the Asheville community. Recently, it was renovated, using the Federal historic preservation tax incentives for the rehabilitation of a certified historic structure. An African American owned restaurant is located on the first floor. The second and third floors will be rehabilitated for office and residential uses. 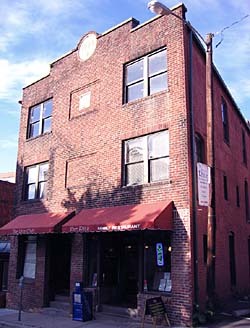 The African American Masonic Temple is located at 42-44 S. Market St., within the Downtown Asheville Historic District. The first floor now houses a restaurant open to the public, Monday-Saturday. For more information call 828-225-3031.